Large groups Group is ideal for mid- to large-size video conferences. If you have a larger room or larger groups, the optional expansion mics will extend the audio range to 8.5m or 28 feetSharp video qualityThis video system offers HD 1080p video quality at 30 frames-per-second.Clear audio qualityGroup has full-duplex speakerphone with life-like sound that''s crisp, clear, and highly intelligible.90-degree field of viewEveryone can be seen with the 90-degree field of view. 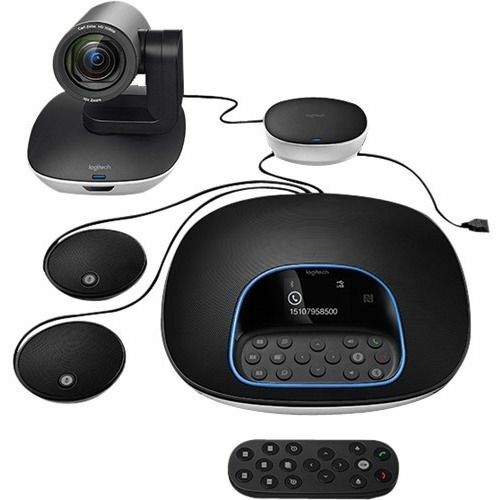 Focus on speaker, material, or whiteboard with mechanical 260-degree pan and 130-degree tiltRemote controlYou have two ways to operate the camera''s pan, tilt, and zoom functions, or the speakerphone''s volume up/down and answer/hang-up. Control these functions on the speakerphone console or with remote control. Keep track of the remote by docking it in the console when not in use.Five camera presetsMultiple camera presets make it easy to frame and focus the lens on frequently used views - such as the conference table, whiteboard, and close-ups - and quickly return to each view at the touch of a button.